Zhong Zhong (left) and Hua Hua are the first primate clones made by somatic cell nuclear transfer, the same process that created Dolly the sheep in 1996. Chinese researchers have finally figured out how to clone a primate, using the same technique Scottish researchers devised to clone the first mammal, Dolly the sheep, in the mid-1990s. 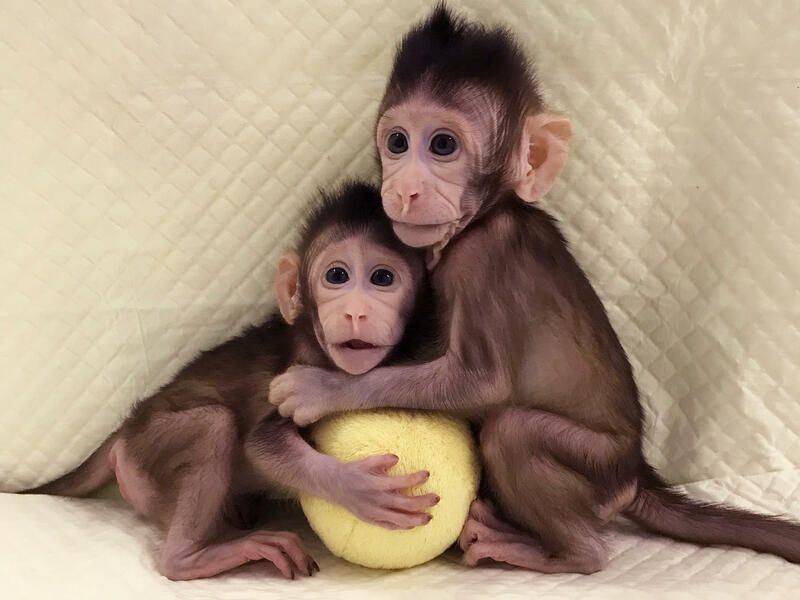 Scientists in Shanghai say they've produced two cloned macaque monkeys by taking the DNA from the nuclei of fetal monkey cells and putting the genes into monkey eggs that had their own DNA removed. The scientists then stimulated the eggs to develop into embryos, which were placed into the wombs of female surrogate monkeys to develop into baby monkeys. It's the first time the technology, called somatic cell nuclear transfer, has been used to clone any close relative of humans. The researchers hope to use the advance to create genetically identical monkeys for medical research. They describe their work in the journal Cell. "We're excited — extremely excited," Mu-ming Poo of the Chinese Academy of Sciences said. "This is really, I think, a breakthrough for biomedicine." He sees a need to have "genetically identical monkeys for studying many human diseases, especially brain diseases" such as Alzheimer's, Huntington's and Parkinson's. Other scientists agree the development could prove very useful. "I think it's a very exciting landmark. It's a major advance," says Dieter Egli, a reproductive biologist at Columbia University. "It should be possible to make models of human disease in those monkeys and study those and then attempt to cure it." But the step also raises concern that someone might try to use the same technique to clone humans, given the biological similarities between monkeys and humans. "People may wonder: Are human beings next?" says Insoo Hyun, a bioethicist at Case Western Reserve University. "People have always been worried about the possibility of human cloning. And this is just yet another step in that direction." The Chinese scientists acknowledge that any new technology can be abused. But they stress they have no interest in ever trying to clone a person. "Technically speaking one can clone human," Poo says. "But we're not going to do it. There's absolutely no plan to do anything on humans." Ever since Scottish researchers cloned Dolly the sheep, scientists have attempted to use the same technique to clone other mammals. They've succeeded with many species, including mice, dogs, cows, horses and rabbits. Scientists cloned rhesus monkeys using a different method known as embryo splitting. But that technique isn't considered useful for producing large numbers of genetically modified clones for medical research. Researchers have also created cloned human embryos, even after earlier claims of doing so were determined to have been fraud. But that work was done to obtain human embryonic stem cells for research. Despite decades of trying, no one had ever succeeded in using the same method used to create Dolly to clone a primate. "It's been tried for so many years and it hasn't worked," says Shoukhrat Mitalipov, director of the Center for Embryonic Cell and Gene Therapy at the Oregon Health & Science University in Portland, Ore. "This time it worked, which is a big deal." Poo's team succeeded by removing the DNA from fetal monkeys instead of using adult cells as a starting point. The scientists then transferred the genes into monkey eggs that had had their own DNA removed. The next step was also crucial, Poo says. The researchers stimulated the eggs to develop into embryos with a new mix of chemical signals. "The trick is we choose the right chemicals to turn on these genes we transfer into the egg," Poo says. "So that's what we did different. I think that's the key." The researchers then transplanted the cloned monkey embryos into surrogate female monkeys. Two baby macaque monkey clones were born six and eight weeks ago. Their names are Zhong Zhong and Hua Hua after the Chinese word Zhonghua, which means "Chinese people." "They are lively. They are walking, jumping, playing around like all newborn baby monkeys," Poo says, adding that so far they seem very healthy. Many bioethicists and scientists say it would be highly unethical to even try to clone a person the same way. The first concern is safety. For example, most of the cloned Chinese monkeys died in the womb or soon after birth. "So safety of the resulting child is a major concern," Hyun says. But even if it were safe, many researchers say there are many other reasons to never try. "Cloning one individual in the image of another really sort of demeans the significance of us as individuals," says Dr. George Daley, dean of the Harvard Medical School. "There's a certain sort of gut sense that it violates sort of natural norms." Daley and others fear a rogue scientist somewhere could attempt human cloning, even though there are laws against it in many countries. "We live in such a celebrity-driven world that there are unscrupulous practitioners who might try this," Daley says. Chinese researchers have finally done something scientists have been trying to do for decades - use the same technique that cloned Dolly the sheep to clone a primate. The advance could be a big boon to medical research, and NPR health correspondent Rob Stein has details. ROB STEIN, BYLINE: Ever since Dolly the sheep was cloned, scientists have been trying to use the same technique to clone other species, and it's worked. They've cloned cows, dogs, pigs, cats and a long list of other species, but no one has ever been able to clone a chimp or an ape or any other primates. Some started to think it just wasn't possible, until now. MU-MING POO: We're excited. Lot of people are excited. STEIN: That's Mu-ming Poo at the Chinese Academy of Sciences. We talked on Skype. POO: This is really, I think, a breakthrough for biomedicine. STEIN: Two baby macaque monkey clones were born in Shanghai six and eight weeks ago. Their names are Zhong Zhong and Hua Hua, after the Chinese word Zhonghua, which means Chinese people. POO: They are lively. They are walking, jumping, playing around like all newborn baby monkeys. STEIN: Poo's team finally did it by pulling the DNA out of cells from fetal monkeys, putting the genes into monkey eggs and then tricking the eggs into developing into embryos with just the right chemical signals. POO: The trick is that we choose the right chemicals to turn on these genes we transfer into the egg, OK? So that's what we did different. I think that's the key. STEIN: They then transplanted the cloned monkey embryos into surrogate female monkeys. But why? Why clone monkeys? Well, because primates like monkeys are our closest relatives, so scientists could use cloned monkeys to study a long list of terrible diseases and hopefully find new cures. POO: We need to have genetically identical monkeys that's cloned for study many human diseases, especially brain diseases. STEIN: Brain diseases like Alzheimer's, Parkinson's, Huntington's, maybe even autism. DIETER EGLI: I think it's a very exciting landmark. It's a major advance. STEIN: That's Dieter Egli, a biologist at Columbia. EGLI: These monkeys should be useful for medical research. It should be possible to make models of human disease in those monkeys, and study those and then attempt to cure it. STEIN: But this step is also causing some concerns. INSOO HYUN: This is a case of monkey see, monkey do. STEIN: Insoo Hyun is a bioethicist at Case Western Reserve University. HYUN: People may wonder, are human beings next? People have always been worried about the possibility of human cloning, and this is just a - yet another step in that direction. So there is certainly a concern about, how close are we to the reality of human cloning? STEIN: Because human biology is so similar to monkeys. But Hyun and others say it would be highly unethical to even try, for lots of reasons. First of all, it's not safe. A lot of the cloned monkey embryos the Chinese created died in the womb or soon after birth. HYUN: So safety of the resulting child is a major concern. STEIN: But even if it was safe, many say there are big reasons never to try. George Daley is the dean of the Harvard Medical School. GEORGE DALEY: Cloning one individual in the image of another really sort of demeans the significance of us as individuals. There's a certain sort of gut sense that it violates sort of a natural norms. STEIN: But Daley worries that some rogue scientist somewhere might try, even though there are laws against human cloning in many countries. DALEY: We live in such a celebrity-driven world that there are unscrupulous practitioners who might try this. STEIN: The Chinese scientists acknowledged that any new technology can be abused but stressed they have no interest in ever trying to clone a person. POO: Technically speaking, one can clone human, but we are not going to do it. There is absolutely no plan to do anything on a human. STEIN: They just want to find new ways to cure diseases, so they already have other monkeys pregnant with cloned embryos in the hopes they'll give birth to more cloned monkeys soon. Rob Stein, NPR News. Transcript provided by NPR, Copyright NPR.